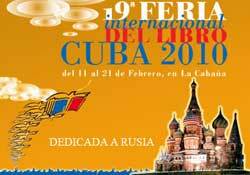 The 2010 19th Internacional Book Fair of Cuba will arrive at the eastern provinces of Cuba as of March 3 informed AIN news agency. Publishing houses and readers from Ciego de Avila, Camaguey, Santiago de Cuba, Granma, Holguin, Las Tunas and Guantanamo anxiously await this cultural event with a large participation of the public in the island. During its tour along western Cuba, as is customary, it will be attended by many well known intellectuals including Reynaldo Gonzalez and Maria del Carmen Barcias to whom this event is dedicated. Among the most important titles are classics of Russian literature such as Crime and Punishment by Fyodor Dostoyevsky, War and Peace by Leon Tolstoy, The teacher and Margarita by Mijail Bulgakov as well as chosen texts by Alexander Pushkin. This event inaugurated on February 11 in the Cuban capital by President Raul Castro and Russian Foreign minister, Serguei Lavrov whose country assists as guest of honor. During its 19th event, the Havana International Book Fair has presented more than 400 titles and 6 million books available to readers will conclude March 7 in Santiago de Cuba. Culture minister Abel Prieto Jimenez, after concluding in the west expressed that the Fair has become an event of the Cuban family as a result of its massive assistance and preferences.